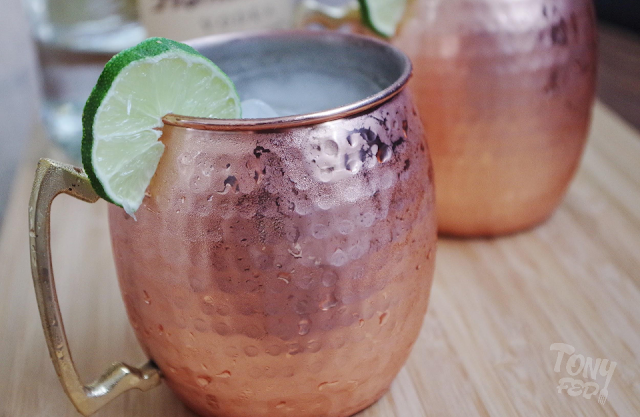 I was first introduced to the Moscow Mule, a combination of vodka, ginger beer, and lime, at the downtown Austin location of the Alamo Drafthouse. My wife and I were watching an early afternoon showing of Interstellar, which, if you haven't seen it, is a particularly mind-bending movie that explores not only outer space, but the nature of reality itself. Thankfully, these deep thoughts were tempered by the fact that the Alamo Drafthouse serves up a wide variety of cocktails, beer/wine, and food along with it's films. And so I found myself with a Moscow Mule in hand, and was immediately hooked on its combination of sparkling citrus, ginger, and top shelf vodka. Since that first sip, I've been a Moscow Mule ordering fiend, sampling the drink anytime I come across it. Unfortunately, I've had a fair share of stinkers that didn't stack up to my first experience. Whether it was too much sugar, not enough vodka, or a weak ginger bite, there always seemed to be something a little off. So, I set about recreating my own version, and figured, "What the heck? Why not make it Paleo too!" This reimagined version of the Moscow Mule substitutes ginger infused kombucha tea in place of the traditional ginger beer. This cuts the sugar content dramatically while keeping the effervescence and ginger flavor of the original drink intact. I also used Austin Texas distilled Tito's Vodka in homage of my first Moscow Mule experience. Distilled six times, Tito's is super smooth and makes the Kosmic Mule pretty easy drinking, so watch yourself otherwise you might end up like Matthew McConaughey's character in Interstellar. Fill two cups with crushed ice. Pour half of the ginger kombucha and half of the lime juice into each up. Add two shots of vodka to each cup and stir.